Amber can help with growing Wisdom Teeth Pain. Did you know that adults can have teething problems? I’m talking about the Wisdom Teeth. They are named as such because they begin to grow when one is supposedly older and wiser. But they can hurt every bit as much as the first round of tooth growth. And an Amber Necklace can be the answer. The growth of these larger teeth at the back of the jaw can go unnoticed by some but for others it is an ongoing chronic pain that can be every bit as bad as the pain suffered by tots. I would describe it as a dull rumbling constant discomfort rather than the acute pain of a toothache. But it is every bit as real. Some people experience sharp jabs of pain also. And adults cannot simply breakdown and cry like a baby. They must find a way to cope with it. Taking pain relief every 4 hours is not the ideal solution either. 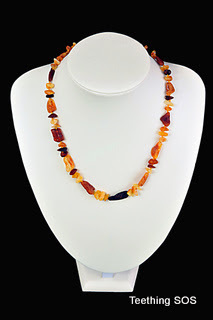 By wearing an Amber Necklace, adult sized of course, you can reduce the pain in a simple natural way. Amber can also reduce the inflammation of the gums. I have direct feedback that amber helps. At the first Fair we exhibited at, the first customer of the day was intrigued by our name and came straight over to ask “Will it help with my wisdom teeth?” My answer - “Try it and you tell me”. And thankfully she took me up on my offer of a free trial in return for her feedback. A month later she told me that it had made an immense difference. As anyone who suffers a chronic pain can tell, you can put up with it most of the time but it is wearing and tiring and it brings you down. When wearing amber, she could report that the discomfort had completely disappeared. The teeth were still slowly growing but no longer caused her bother. Now I must point out that Wisdom Teeth are sometimes not very wise in how they grow and can sometimes fail to come through how they should. If you are feeling any discomfort, it is advisable to have a dentist check it out. Our advice is in no way intended as a substitute for medical or dental advice but amber can be used as a treatment in conjunction with any other treatment recommended by your health care professional. So adults sometimes need teething relief too. This Natural Nugget Necklace would be ideal. But please look at our full range of Amber Necklaces to choose one to to help with your wisdom teeth!